A lot has been said about the difference between digital and optical image stabilization on smartphone camera set-ups. If video capture is important to you on a device then you might be interested in this look at the Samsung Galaxy S5 vs. LG G2 in a video footage showdown. Put basically, digital stabilization (DS) is produced from software enhancements rather than a built-in camera unit component, which is the case with optical image stabilization (OIS). Hence OIS is seen as the superior of the two options, offering steadier video capture. The new Galaxy S5 has digital stabilization while the LG G2 features OIS, so how does the S5 video performance stand up against that of the G2? That’s what this video comparison aims to show, and for once the results may surprise you. It looks as though Samsung has made real headway with DS results, as the YouTube video that we’ve embedded below from Phone Arena shows. 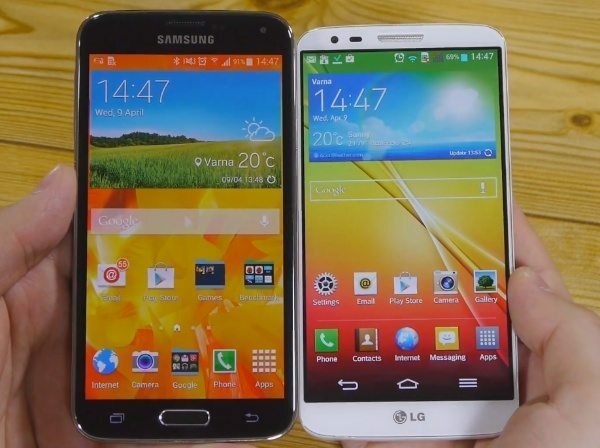 The video shows sample video footage of the same scene taken with the Galaxy S5 and LG G2 alongside each other, so that you easily compare the performance of both. The Galaxy S5 footage appears to be equally as good as that of the LG G2 with OIS, and on occasion even better. Phone Arena does make the good point though that OIS has other benefits than just video capture, as it can enable shooting at slower shutter speeds. However, it’s not clear if that’s the case with the LG G2. After viewing the video below we’d be really interested to hear your verdicts on which smartphone you think offers the better quality video footage. Would you say it was the Samsung Galaxy S5 or the LG G2? Are people afraid to say when iPhone and Samsung loses a battle. Stabalization was about even but the Samsung lost the picture in picture quality. I preferred the LG G2. The overall picture is better and colors more accurate. The S5 video was way to dark for me. I did, however, appreciate less bobbing while one is walking and shooting video on the S5. Still, I would go with the G2 based on this video. The G2 is clearer, crisper, and more stable. Seems like the fps are better with the LG. before you buy Sansung S5. major issue with its Camera. I have numerous complain ids, one of them is given below: 4171269514. Is there any inbuilt antitheft feature in LG G2 ? I bought LG G2 two months ago, and lost it a week ago. Can i track my mobile, even if there was no antitheft application installed ? Android device manager website is your best bet. G2’s picture was better but why were they shaking it so much? It looked like they were holding the S5 still and they were shaking the G2.